This article is about the virtualization software. For other uses, see Xen (disambiguation). Xen Project (pronounced /ˈzɛn/) is a type-1 hypervisor, providing services that allow multiple computer operating systems to execute on the same computer hardware concurrently. It was developed by the University of Cambridge and is now being developed by the Linux Foundation with support from Intel. Xen Project runs in a more privileged CPU state than any other software on the machine. Responsibilities of the hypervisor include memory management and CPU scheduling of all virtual machines ("domains"), and for launching the most privileged domain ("dom0") - the only virtual machine which by default has direct access to hardware. From the dom0 the hypervisor can be managed and unprivileged domains ("domU") can be launched. The dom0 domain is typically a version of Linux or BSD. User domains may either be traditional operating systems, such as Microsoft Windows under which privileged instructions are provided by hardware virtualization instructions (if the host processor supports x86 virtualization, e.g., Intel VT-x and AMD-V), or para-virtualized operating systems whereby the operating system is aware that it is running inside a virtual machine, and so makes hypercalls directly, rather than issuing privileged instructions. Xen Project boots from a bootloader such as GNU GRUB, and then usually loads a paravirtualized host operating system into the host domain (dom0). Xen originated as a research project at the University of Cambridge led by Ian Pratt, a senior lecturer in the Computer Laboratory, and his PhD student Keir Fraser. The first public release of Xen was made in 2003, with v1.0 following in 2004. Soon after, Pratt and Fraser along with other Cambridge alumni including Simon Crosby founded XenSource Inc. to turn Xen into a competitive enterprise product. The Open Source Xen Project continued to be a supported by XenSource, then by Citrix following XenSource's acquisition in October 2007. This organization supports the development of the free software project and also sells enterprise versions of the software. To support embedded systems such as smartphone/ IoT with relatively scarce hardware computing resources, Secure Xen ARM architecture on ARM CPU exhibited at Xen Summit on April 17, 2007 held in IBM TJ Watson and the first public release of Secure Xen ARM source code was made at Xen Summit on June 24, 2008 by Sang-bum Suh, a Cambridge alumnus, in Samsung Electronics. On October 22, 2007, Citrix Systems completed its acquisition of XenSource, and the Xen Project moved to the xen.org domain. This move had started some time previously, and made public the existence of the Xen Project Advisory Board (Xen AB), which had members from Citrix, IBM, Intel, Hewlett-Packard, Novell, Red Hat, Sun Microsystems and Oracle. The Xen Advisory Board advises the Xen Project leader and is responsible for the Xen trademark, which Citrix has freely licensed to all vendors and projects that implement the Xen hypervisor. Citrix uses the Xen brand itself for some proprietary products unrelated to Xen, including XenApp and XenDesktop. On April 15, 2013, it was announced that the Xen Project was moved under the auspices of the Linux Foundation as a Collaborative Project. The Linux Foundation launched a new trademark for "Xen Project" to differentiate the project from any commercial use of the older "Xen" trademark. A new community website was launched at xenproject.org as part of the transfer. Project members at the time of the announcement included: Amazon, AMD, Bromium, CA Technologies, Calxeda, Cisco, Citrix, Google, Intel, Oracle, Samsung, and Verizon. The Xen project itself is self-governing. 2.0 November 5, 2004 Live migration of PV guests. Supports the Intel VT technology for HVM guests. Support for the Intel IA-64 architecture. Support for the AMD SVM virtualization extensions. Support for the PowerPC architecture. Graphical framebuffer support for paravirtualized guests. 3.2 January 17, 2008 PCI passthrough and ACPI S3 standby mode for the host system. 3.4 May 18, 2009 Contains a first version of the "Xen Client Initiative", shortly XCI. 4.0 April 7, 2010 Makes it possible to use a dom0 Linux kernel, which has been implemented by using PVOps. A Linux kernel of version 2.6.31 has been modified for this purpose, because the official Linux kernel actually does not support the usage as dom0 kernel (date July 2010). 4.1 March 25, 2011 Some of the improvements: Support for more than 255 processors, better stability. Linux kernel v2.6.37 and onward support usage as dom0 kernel. 4.2 September 8, 2012 XL became the default toolstack. Support for up to 4095 host processors and up to 512 guest processors. 4.3 July 9, 2013 Experimental ARM support. NUMA-aware scheduling. Support for Open vSwitch. 4.4 March 10, 2014 Solid libvirt support for libxl, new scalable event channel interface, hypervisor ABI for ARM declared stable, Nested Virtualization on Intel hardware. 4.5 January 17, 2015 With 43 major new features, 4.5 includes the most updates in the project’s history. 4.6 October 13, 2015 Focused on improving code quality, security hardening, enablement of security appliances, and release cycle predictability. 4.7 June 24, 2016 Improved: security, live migrations, performances and workload. Hardware support (ARM and Intel Xeon). Since version 3.0 of the Linux kernel, Xen support for dom0 and domU exists in the mainline kernel. Internet hosting service companies use hypervisors to provide virtual private servers. Amazon EC2 (since August 2006), IBM SoftLayer, Liquid Web, Fujitsu Global Cloud Platform, Linode, OrionVM and Rackspace Cloud use Xen as the primary VM hypervisor for their product offerings. Xen's support for virtual machine live migration from one host to another allows workload balancing and the avoidance of downtime. 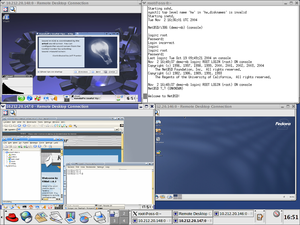 Virtualization also has benefits when working on development (including the development of operating systems): running the new system as a guest avoids the need to reboot the physical computer whenever a bug occurs. Sandboxed guest systems can also help in computer-security research, allowing study of the effects of some virus or worm without the possibility of compromising the host system. Finally, hardware appliance vendors may decide to ship their appliance running several guest systems, so as to be able to execute various pieces of software that require different operating systems. Xen supports five different approaches to running the guest operating system: HVM (hardware virtual machine), HVM with PV drivers, PVHVM (paravirtualization with full hardware virtualization, i.e. HVM with PVHVM drivers), PVH (PV in an HVM container) and PV (paravirtualization). Xen supports a form of virtualization known as paravirtualization, in which guests run a modified operating system. The guests are modified to use a special hypercall ABI, instead of certain architectural features. Through paravirtualization, Xen can achieve high performance even on its host architecture (x86) which has a reputation for non-cooperation with traditional virtualization techniques. Xen can run paravirtualized guests ("PV guests" in Xen terminology) even on CPUs without any explicit support for virtualization. Paravirtualization avoids the need to emulate a full set of hardware and firmware services, which makes a PV system simpler to manage and reduces the attack surface exposed to potentially malicious guests. On 32-bit x86, the Xen host kernel code runs in Ring 0, while the hosted domains run in Ring 1 (kernel) and Ring 3 (applications). CPUs that support virtualization make it possible to support unmodified guests, including proprietary operating systems (such as Microsoft Windows). This is known as hardware-assisted virtualization, however in Xen this is known as hardware virtual machine (HVM). HVM extensions provide additional execution modes, with an explicit distinction between the most-privileged modes used by the hypervisor with access to the real hardware (called "root mode" in x86) and the less-privileged modes used by guest kernels and applications with "hardware" accesses under complete control of the hypervisor (in x86, known as "non-root mode"; both root and non-root mode have Rings 0–3). Both Intel and AMD have contributed modifications to Xen to support their respective Intel VT-x and AMD-V architecture extensions. Support for ARM v7A and v8A virtualization extensions came with Xen 4.3. HVM extensions also often offer new instructions to support direct calls by a paravirtualized guest/driver into the hypervisor, typically used for I/O or other operations needing high performance. These allow HVM guests with suitable minor modifications to gain many of the performance benefits of paravirtualized I/O. In current versions of Xen (up to 4.2) only fully virtualized HVM guests can make use of hardware support for multiple independent levels of memory protection and paging. As a result, for some workloads, HVM guests with PV drivers (also known as PV-on-HVM, or PVH) provide better performance than pure PV guests. Xen HVM has device emulation based on the QEMU project to provide I/O virtualization to the virtual machines. The system emulates hardware via a patched QEMU "device manager" (qemu-dm) daemon running as a backend in dom0. This means that the virtualized machines see an emulated version of a fairly basic PC. In a performance-critical environment, PV-on-HVM disk and network drivers are used during normal guest operation, so that the emulated PC hardware is mostly used for booting. Administrators can "live migrate" Xen virtual machines between physical hosts across a LAN without loss of availability. During this procedure, the LAN iteratively copies the memory of the virtual machine to the destination without stopping its execution. The process requires a stoppage of around 60–300 ms to perform final synchronization before the virtual machine begins executing at its final destination, providing an illusion of seamless migration. Similar technology can serve to suspend running virtual machines to disk, "freezing" their running state for resumption at a later date. The Xen hypervisor has been ported to a number of processor families. ARM: previously supported under the XenARM project for older versions of ARM without virtualization extensions, such as the Cortex-A9. Currently[when?] supported since Xen 4.3 for newer versions of the ARM with virtualization extensions, such as the Cortex-A15. Xen can scale to 4095 physical CPUs, 256 VCPUs per HVM guest, 512 VCPUs per PV guest, 16 TB of RAM per host, and up to 1 TB of RAM per HVM guest or 512 GB of RAM per PV guest. Xen can be shipped in a dedicated virtualization platform, such as Citrix XenServer Enterprise Edition (formerly XenSource's XenEnterprise). Alpine Linux offers a minimal dom0 system (Busybox, UClibc) that can be run from removable media, like USB sticks. Arch Linux provides the necessary packages with detailed setup instructions on their Wiki. FreeBSD 11 includes experimental host support. Gentoo has the necessary packages available to support Xen, along with instructions on their Wiki. NetBSD can function as domU and dom0. OpenSolaris-based distributions can function as dom0 and domU from Nevada build 75 onwards. Qubes OS offers Xen built-in for secure desktop usage. For an updated list differentiating PV and PVHVM support, see DomU Support for Xen. Xen version 3.0 introduced the capability to run Microsoft Windows as a guest operating system unmodified if the host machine's processor supports hardware virtualization provided by Intel VT-x (formerly codenamed Vanderpool) or AMD-V (formerly codenamed Pacifica). During the development of Xen 1.x, Microsoft Research, along with the University of Cambridge Operating System group, developed a port of Windows XP to Xen — made possible by Microsoft's Academic Licensing Program. The terms of this license do not allow the publication of this port, although documentation of the experience appears in the original Xen SOSP paper. James Harper and the Xen open-source community have started developing GPL'd paravirtualization drivers for Windows. These provide front-end drivers for the Xen block and network devices, and allow much higher disk and network performance for Windows systems running in HVM mode. Without these drivers all disk and network traffic has to be processed through QEMU-DM. Novell's PlateSpin Orchestrate also manages Xen virtual machines for Xen shipping in SUSE Linux Enterprise Server. Crucible (hypervisor) by Star Lab Corp. The Xen hypervisor is covered by the GNU General Public Licence, so all of these versions contain a core of free software with source code. However, many of them contain proprietary additions. ^ "Xen 4.12.0 released". Juergen Gross. April 1, 2019. Retrieved April 4, 2019. ^ "Xen Overview". Retrieved April 5, 2015. ^ "OSCompatibility - Xen Project Wiki". Wiki.xenproject.org. February 8, 2007. Retrieved June 8, 2013. ^ "Citrix Systems » Citrix Completes Acquisition of XenSource". Citrix Systems. July 12, 2007. ^ "Trademark". Xen.org. Retrieved June 8, 2012. ^ "Trademark Policy" (PDF) (PDF). Xen.org. June 1, 2008. Retrieved June 8, 2013. ^ "Linux Foundation Project". LinuxFoundation.org. Retrieved May 3, 2013. ^ "XenProject.org Website". XenProject.org. Retrieved May 3, 2013. ^ "Linux Foundation Xen Project Members". XenProject.org. Retrieved May 3, 2013. ^ "Project Governance (Updated)". XenProject.org. Retrieved May 3, 2013. ^ "Xen:". SourceForge.net. October 2, 2003. Retrieved October 18, 2012. ^ Jonathan Corbet (October 2, 2003). "The first stable Xen release". Lwn.net. Retrieved October 18, 2012. ^ Jonathan Corbet (November 5, 2004). "Xen 2.0 released". Lwn.net. Retrieved October 18, 2012. ^ Jonathan Corbet (December 6, 2005). "Xen 3.0 released". Lwn.net. Retrieved October 18, 2012. ^ "XenSource: Press Releases". XenSource, Inc. December 10, 2005. Archived from the original on December 10, 2005. Retrieved October 18, 2012. ^ "AMD SVM Xen port is public". lists.xenproject.org. December 14, 2005. Retrieved June 8, 2013. ^ "[Xen-devel] Xen 3.0.3 released! - Xen Source". Lists.xenproject.org. October 17, 2006. Retrieved June 8, 2013. ^ "[Xen-devel] FW: Xen 3.0.4 released! - Xen Source". Lists.xenproject.org. December 20, 2006. Retrieved June 8, 2013. ^ "[Xen-devel] Xen 3.1 released! - Xen Source". Lists.xenproject.org. May 18, 2007. Retrieved June 8, 2013. ^ "Xen 3.2.0 Officially Released : VMblog.com - Virtualization Technology News and Information for Everyone". VMblog.com. Retrieved October 18, 2012. ^ "Xen 3.3.0 hypervisor ready for download - The H: Open Source, Security and Development". H-online.com. August 25, 2008. Archived from the original on March 14, 2012. Retrieved October 18, 2012. ^ "Xen.org Announces Release Of Xen 3.4 Hypervisor | Citrix Blogs". Community.citrix.com. May 18, 2009. Retrieved October 18, 2012. ^ "Virtualisation: Xen is looking to catch up by releasing version 4 - The H Open: News and Features". H-online.com. April 9, 2010. Archived from the original on March 14, 2012. Retrieved October 18, 2012. ^ "Xen 4.0 Datasheet" (PDF) (PDF). Xen.org. Retrieved October 18, 2012. ^ "Xen 4.1 releases –". Blog.xen.org. March 25, 2011. Retrieved October 18, 2012. ^ "XenParavirtOps - Xen Wiki". Wiki.xenproject.org. Retrieved June 8, 2013. ^ a b c "Best Quality and Quantity of Contributions in the New Xen Project 4.6 Release". Xenproject.org. October 13, 2015. Retrieved October 13, 2015. ^ "Xen 4.3 released! –". Blog.xen.org. July 9, 2013. Retrieved July 16, 2013. ^ "Xen 4.4 releases –". Blog.xen.org. March 10, 2014. Retrieved March 10, 2014. ^ "Xen Project 4.4 Release Notes". Wiki.xenproject.org. Retrieved March 10, 2014. ^ "Xen 4.4 Feature List". Wiki.xenproject.org. Retrieved March 10, 2014. ^ a b "Less is More in the New Xen Project 4.5 Release –". Blog.xen.org. January 15, 2015. Retrieved January 17, 2015. ^ "Xen Project 4.8.1 is available". Xenproject.org. April 12, 2017. Retrieved June 1, 2017. ^ "Xen Project 4.7 Feature List". Xen project. June 24, 2016. ^ "Xen Project 4.8.1 is available | Xen Project Blog". blog.xenproject.org. Retrieved February 19, 2018. ^ "What's New in the Xen Project Hypervisor 4.9". Retrieved April 26, 2018. ^ "What's New in the Xen Project Hypervisor 4.10". Retrieved April 26, 2018. ^ Gross, Juergen (July 10, 2018). "What's New in the Xen Project Hypervisor 4.11". Retrieved January 17, 2018. ^ "Xen celebrates full dom0 and domU support in Linux 3.0 –". Blog.xen.org. May 30, 2011. Retrieved October 18, 2012. ^ "CloudLayer Computing vs. Amazon EC2" (PDF) (PDF). Retrieved April 5, 2015. ^ Suzanne Tindal (February 28, 2011). "Fujitsu's global cloud launches in Aus". ZDNet Australia. ^ "Xen Project - Guest VM Images - OrionVM PV-HVM Templates". April 1, 2012. Retrieved June 27, 2014. ^ "Cloud FAQ". Rackspace.com. September 13, 2011. Retrieved October 18, 2012. ^ "Choosing a virtualization mode (PV versus PVHVM)". Rackspace Support Network. Rackspace. January 12, 2016. Retrieved January 25, 2018. ^ Roger Pau Monne. "Xen virtualization on FreeBSD" (PDF) (PDF). Retrieved April 6, 2015. ^ Gil Neiger, Amy Santoni, Felix Leung, Dion Rodgers, Rich Uhlig. Intel Virtualization Technology: Software-only virtualization with the IA-32 and Itanium architectures, Intel Technology Journal, Volume 10 Issue 03, August 2006. ^ "The ARM Hypervisor - The Xen Project's Hypervisor for the ARM architecture". Retrieved April 6, 2015. ^ "Xen 4.2 Feature List - Xen". Wiki.xen.org. December 17, 2012. Retrieved January 22, 2014. ^ "XenPPC - Xen Wiki". New-wiki.xen.org. August 15, 2010. Retrieved January 22, 2014. ^ Mashable (September 4, 2012). "Porting Xen Paravirtualization to MIPS Architecture". Slideshare.net. Retrieved January 22, 2014. ^ "Xen Release Features - Xen Project". Wiki.xenproject.org. Retrieved October 18, 2012. ^ "AUR (en) - xen". Aur.archlinux.org. Retrieved April 12, 2018. ^ "Xen - ArchWiki". Wiki.archlinux.org. Retrieved April 12, 2018. ^ "Xen - FreeBSD Wiki". wiki.freebsd.org. Retrieved September 28, 2015. ^ "Xen". Wiki.gentoo.org. Retrieved April 12, 2018. ^ "NetBSD/xen". Netbsd.org. Retrieved June 8, 2013. ^ "XenDom0Kernels - Xen Wiki". Wiki.xenproject.org. November 8, 2011. Retrieved June 8, 2013. ^ "Xen in Qubes OS Security Architecture". xenp.org. Retrieved April 12, 2018. ^ "Xen dom0 support in Lucid - Kernel team discussions - ArchiveOrange". Web.archiveorange.com. Retrieved January 22, 2014. ^ "Xen - Community Ubuntu Documentation". Help.ubuntu.com. September 5, 2012. Retrieved October 18, 2012. ^ "PV on HVM". Wiki.xen.org. Retrieved April 12, 2018. ^ "Understanding the Virtualization Spectrum". Wiki.xenproject.org. Retrieved April 12, 2018. ^ "FreeBSD/Xen - FreeBSD Wiki". Wiki.freebsd.org. June 25, 2012. Retrieved October 18, 2012. ^ "FreeBSD 11.0-RELEASE Release Notes". The FreeBSD Documentation Project. September 22, 2016. Retrieved October 23, 2016. ^ "xen(4) - OpenBSD Manual Pages". Retrieved December 30, 2017. ^ "Xen and the Art of Virtualization" (PDF) (PDF). University of Cambridge SOSP'03 paper. Retrieved October 18, 2012. ^ The information on the XenSource wiki seems to be outdated, but newer information is here: "Open Source Windows Paravirtualization Drivers for Xen (GPLPV)". Jolokia Networks. Retrieved October 18, 2012. ^ "Citrix Product Matrix". Citrix.com. Retrieved December 6, 2016. ^ "XenServer 6.0 is here! | Citrix Blogs". Citrix Blogs. September 30, 2011. Retrieved December 6, 2016. ^ "Hotfix XS60E061 - For XenServer 6.0". support.citrix.com. Retrieved December 6, 2016. ^ a b c d e f "XenServer Revision History Table". support.citrix.com. Retrieved December 6, 2016. ^ "XenServer 7 Launch - What you need to know | Citrix Blogs". Citrix Blogs. May 24, 2016. Retrieved December 6, 2016. ^ "Hotfix XS70E019 - For XenServer 7.0". support.citrix.com. Retrieved December 6, 2016. ^ "XenServer 7.1 Release Notes". ^ Edwards, Chris (May 30, 2018). "You asked, we delivered. Introducing XenServer 7.5". Citrix Blogs. Retrieved January 17, 2019. ^ Melmed, Andy (September 10, 2018). "Announcing the General Availability of XenServer 7.6!". Citrix Blogs. Retrieved January 17, 2019. ^ "Technical overview". docs.citrix.com. Retrieved January 17, 2019. ^ "Is Xenserver 7.6 using Xen 4.7 or ??". Discussions. Retrieved January 17, 2019. Wikimedia Commons has media related to Xen. This page was last edited on 25 April 2019, at 05:07 (UTC).